View More In Close To Ceiling Lights. 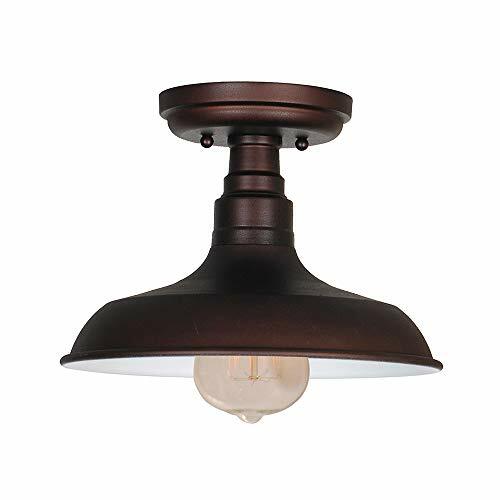 The Design House 519884 Kimball 1 Light Semi Flush Mount Ceiling Light features a modern design and a textured, coffee bronze finish with a metal shade. This ceiling light can be used for room, hallway or foyer lighting. The ceiling light offers reliable lighting with an industrial design. This model uses (1) 60 Watt medium base incandescent bulb (A19 Bulb Type). Ceiling light is designed for ceiling mount applications. Metal shade measures 6-3/4 in. x 11 in. dia. This unit is ETL/cETL Listed and suitable for indoor use. The Design House 519884 Semi-Flush Ceiling Light comes with a 10-year limited warranty. Design House offers products in multiple home decor categories including lighting, ceiling fans, hardware and plumbing products. With years of hands-on experience, Design House understands every aspect of the home decor industry, and devotes itself to providing quality products across the home decor spectrum. If you have any questions about this product by Design House, contact us by completing and submitting the form below. If you are looking for a specif part number, please include it with your message.